And after the jump I’ll tell you why this picture seems to support my worst fears for this film. For those of you that haven’t read Hiroshi Sakurazaka’s book that this film claims to be an adaptation of, what Tom Cruise (playing the films protagonist) is wearing is referred to as a Jacket. It is described as an all enclosing powered armoured mech. The key part there is “all enclosing”. There are several passages in the book (I can’t quote page/chapter numbers right now as I’ve lent my copy of the book to a friend) that explicitly state you cannot see the users face – such as the first time the protagonist meets Rita Vrataski, the ace Jacket pilot. They can only communicate through a direct audio link, as they’re both sealed-up in their jackets. 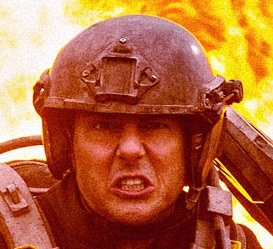 You’ll note that in the picture above, we can see Mr. Cruise’s cheery little face. Yep, that’s definitely his face. And you’ll also notice that there’s precious little armour actually on Mr. Cruise. Aside from a helmet and some knee/shin pads, the rest of it looks like the under-nourished child of Aliens’ Power Loader! I’ve also just realised that taken as a whole, it looks like a cross between Halo’s Mjolnir armour, and Gears of War’s CoG armour – proof that the total isn’t necessarily greater than the sum of it’s parts! Furthermore – and I may not be 100% with this one – they seem to have shrunk the armour. In the book, these things are stored in hangars when not in use, and you have to climb up into them. This doesn’t look as if it takes much more to get into than tightening a few straps and fastening a few buckles. PS: Despite what some sites are claiming, the original All You Need Is Kill is a NOVEL, not a MANGA! 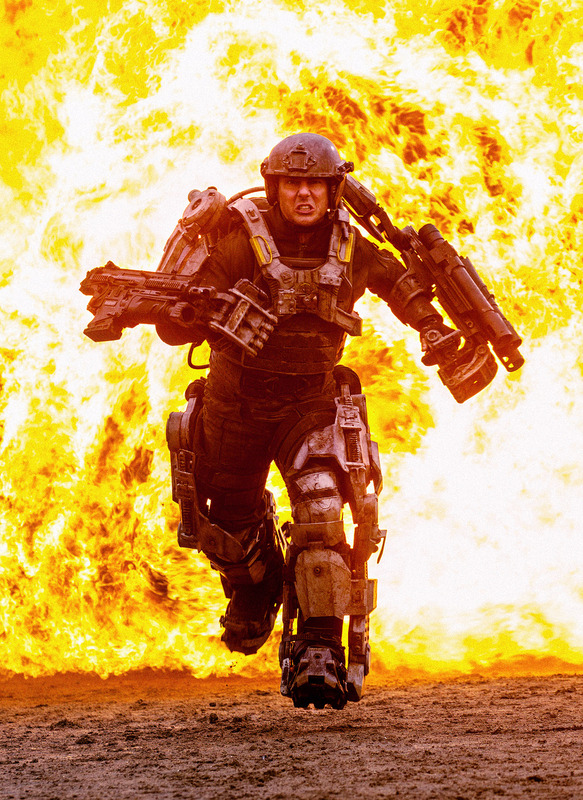 This entry was posted on Saturday, November 10th, 2012 at 11:58 AM	and tagged with All you need is kill, Hiroshi Sakurazaka, Jacket, Mecha, Rooney, Tom Cruise and posted in Films, Japanese. You can follow any responses to this entry through the RSS 2.0 feed.